118 acres of our natural environment will be destroyed, gone forever. Many wild animals will be at risk as their natural habitat disappears. The only natural space that will remain after the destruction will be protected wetlands--nothing else. Water drainage concerns are real and probable. Although the plan calls for water retention and drainage solutions, there are far too few of them delineated, and flooding of roadways, new homes, and existing homes is likely. The "open space" NRDC and Toll Brothers claim to be providing/preserving as ecological compensation for all of the open space they are destroying is misleading and meaningless. 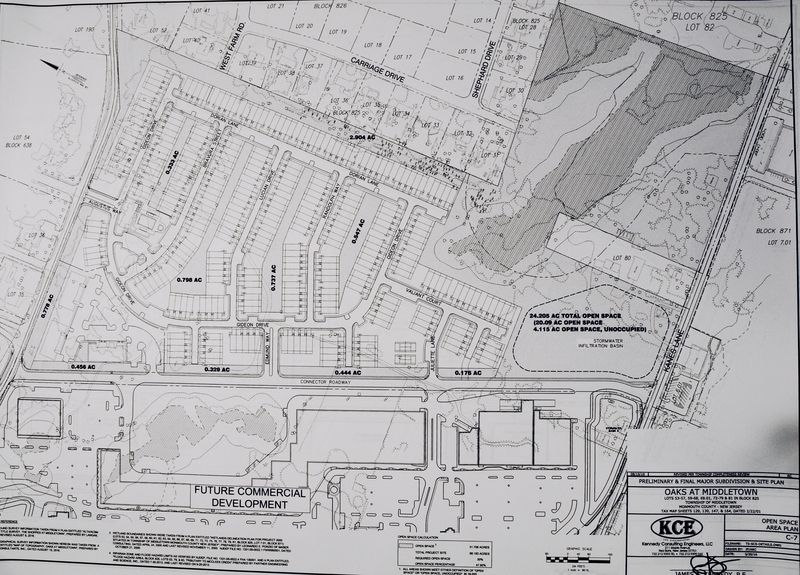 The majority of the "open space" on the proposed residential portion is associated with the wetlands and buffer areas surrounding McClee's Creek. This is an area no one can develop and one which is already protected so in reality, Toll Brothers is creating/protecting nothing associated with this portion of the site. In place of thousands of trees, farmland, and densely vegetated areas of established open space, Toll Brothers is providing its new residents and the surrounding established neighborhoods with almost no usable open space/recreational areas unless you consider landscaped islands throughout the parking lot as little pieces of paradise. NRDC is equally guilty of creating/preserving nothing of any value. Almost all of NRDC's proposed "open space" is associated with storm basins which will be inaccessible to the public and fenced off. They represent almost the entire frontage along Route 35. The last extensive greenway along route 35 in Middletown is about to be replaced by a series of grass pits which offer no ecological value, do nothing to help air, noise, or light pollution, and in no way enhance the aesthetic value of the proposed commercial area. The wetlands area NRDC is creating behind the commercial structures has absolutely no aesthetic or functional value except to act as another form of storm basin. The area will be completely surrounded by roadways and is unattractive for wildlife to use. NRDC is destroying established isolated wetlands on other portions of the site only to replace them with an area which will have far less value. 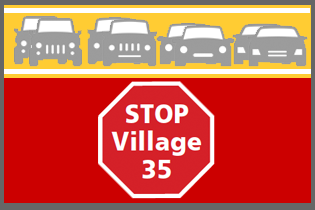 Thousands of trees will be removed for just the commercial portion of Village 35 (over 4,000 estimated). Thousands more will be removed from the residential portion. Both NRDC and Toll Brothers refuse to survey all of the trees on the site as required by ordinance and have requested waivers. NRDC is only required to plant a few hundred replacement trees on the commercial portion and they have requested that the number be cut in half to 209 trees total. Aerial photographs show that this area has always been covered by a dense tree canopy, vegetation, and farmland with isolated wetlands and wetlands associated with McClees Creek. Since the establishment of Middletown, these 118 acres have provided a valuable ecological area for local wildlife. As dense commercial and residential development has encroached all around the property, this area has become an important area for foraging, nesting, and protection for local wildlife. It also acts as a transition/migration pathway between Town Brook (and the Pond) and McClees Creek. NRDC, Toll Brothers, and the NJDEP have underestimated the ecological value of this area. Their proposed plan fails to maintain or provide any meaningful open space transition areas between Town Brook and McClees Creek. Noise, air, and light pollution will all increase as the proposed development is not consistent with surrounding uses. Thousands of vehicles are being added, as thousands of trees and all natural buffers are being removed. - Aesthetics: EIS claims "site contains no unique or noteworthy scenic vistas or other aesthetic attributes. The overall aesthetic value of the tract is considered to be low." What about the scenic corridor preservation along Kings Highway East? What about the thousands of trees, dense vegetation, wildlife, beauty of the natural environment over the majority of the 118 acres? The EIS finding is biased and should be set aside as misleading. - Aesthetics: "The project will be aesthetically consistent with surrounding residential development. Buffering, both vegetative and topographic in nature, between incompatible land uses will provide an aesthetic benefit to the end users of the projects." They must have been looking at a different set of plans than what is being proposed. This entire statement is false. We see no benefits. 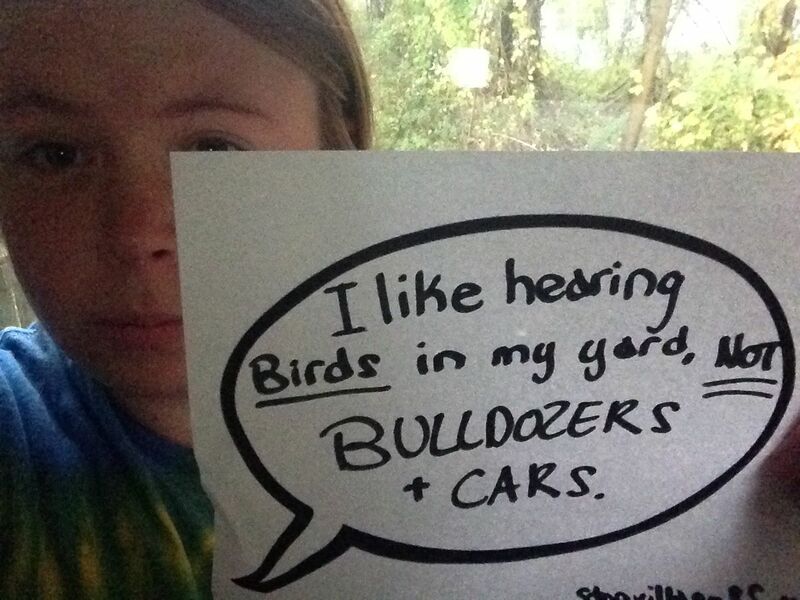 - Noise: "The site and its surroundings appear to be characterized by relatively low ambient noise levels." Then the EIS goes on to state that "it is anticipated that noise levels under proposed conditions will not vary significantly from those under existing conditions, given that the proposed range of uses is largely representative of the uses within the general area." How can they say a residential and commercial development of this size is not going to increase noise? Again, misleading on a number of fronts: thousands of vehicles, hours of operation, etc. - Air Quality: "Expected that the quantity of air pollutants generated under proposed conditions will not significantly impact local air quality." Removing thousands of trees and dense vegetation that filter out pollutants and replacing them with thousands of cars and trucks and heating/utilities for commercial/residents. Another finding that makes no sense and should be set aside. - Wildlife Habitat: "Local wildlife can be expected to make use of the completed project's lawns, landscaping, and open space." Another joke. How much local wildlife do you see using the parking lot areas in any of the residential and commercial areas along Route 35? The only usable open space will be the southeastern wetlands associated with McClee's Creek. No significant vegetated buffers are designed around the perimeter of either the proposed residential or commercial development. All of the "open space" represented by storm basins will be fenced and inaccessible to deer. And if they do make it into this fenced basin area, it will only serve to deliver them directly into Route 35 traffic. - Steps to Minimize Adverse Environmental Impacts: "The woodlands to be lost are of relatively low ecological value... Proposed landscaping, protection of most onsite wetlands, and landscaping and open space areas will provide a measure of ecological compensation." Thousands of trees, dense vegetation, and an established ecosystem being replaced by a few hundred spread out trees, disconnected small scale shrubs and landscaping, and almost no usable open space. How is that compensation? - "The project will provide significant housing and economic benefit, with low environmental cost." That statement is biased, made for the benefit of the developers and owners, and based on greed. In no way does it consider negative impacts to quality of life or the local residents who consider the environmental cost significant! 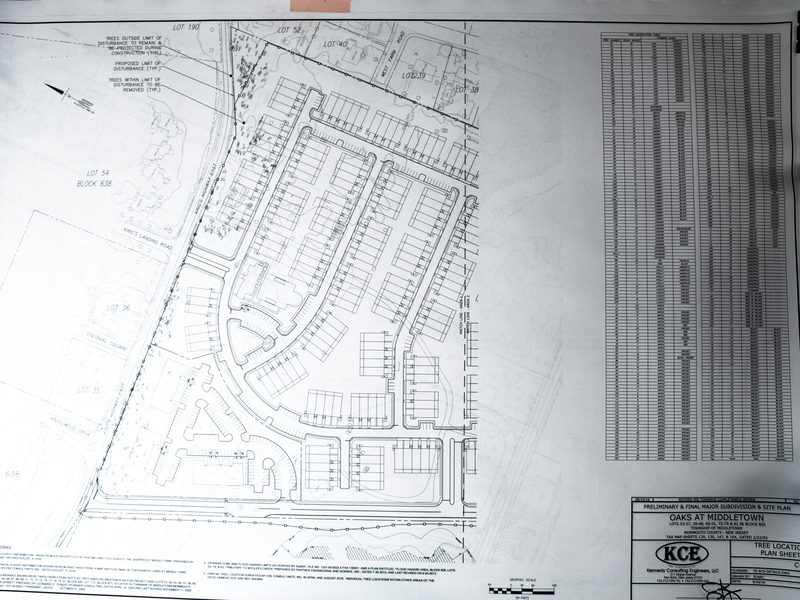 The architectural drawing depicted below shows the Oaks at Middletown and the “area of disturbance” outlined on the map where all the trees will be removed. The right side lists all the trees that fall within the area of construction. Here is the Oaks at Middletown. Note the wetlands area, and the dense area of residential housing.